Having recently posted on Claudia Brücken's Combined, Amazon's mindreaders have sent me an email suggesting I might like to buy the compilation (this has happened with a few records, books and films I've mentioned here). 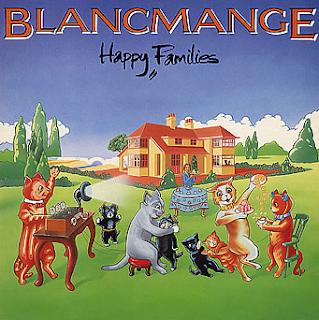 Usefully, the message also alerts me to the first new product from Blancmange for 26 (!) years: Blanc Burn, out 7 March. Middlesex duo Neil Arthur and Stephen Luscombe are best known for 1982 hit Living on the Ceiling, a joyous mélange of nonsense lyrics and tabla beats, the latter courtesy of maestro Pandit Dinesh. Over three albums, anarchical numbers like God's Kitchen, All Things Are Nice and Blind Vision tended to be tempered by such tracks as Time Became the Tide and Waves, a target for bossa babes Nouvelle Vague. On 1984's Mange Tout, a beautiful cover of Abba's The Day Before You Came lies alongside bittersweet See the Train, the a cappella tale of a man seeing off his lover on a train that promptly crashes ('People scream and see the fire... Now I know you won't be back'). Neil Arthur produced catchy album Suitcase in 1994, which leaps from bouncy surrealism to slightly wearying ambience and, I think, scored film and TV work, while Luscombe soundtracked a ballet for Canadian company La La La Human Steps with Dinesh and others - including Asha Bhosle - as the West India Company in 1989. Now they're back back back! British dance innovators The Grid returned to the scene in 2008 with Dopplegänger, having quit after 1995's awful Music for Dancing. While the tunes aren't what they were, Richard Norris and David Ball still conjure a hefty sound that surprises me every time an album track pops up on my iPod. Blanc Burn's final title, Starfucker, has me slightly worried but I wonder what a hiatus of more than a quarter of a century has produced.